Here are Fun Brain Teasers for Kids, Teens and Adults for challenging your Brain. Some of these teasers are very easy but some are tough. See how many you can solve yourself without looking at answers. Answers to these Fun Brain Teasers Questions are given. To avoid any spoilers, we have separated answers to these brain teasers and posted these answers in different posts. Links to answer to each of these brain teasers is given after every question. Please do scroll till the end of the linked answer post to watch the answer to these fun brain teasers. 1. Charles's mom had three children. The first was named June, the second was July. What was the name of the third child? 2. This is a very interesting brain teaser. The manufacturer does not want to use it, the buyer does not need to use it and the user does not know he is using it. 3. This is a brain twisting riddle to test your word power. The word CANDY can be spelt using just 2 letters. Can you figure out how? 4. Ram bets Sham $100 that he can predict the score of the hockey game before it starts. Sham agrees but loses the bet. Why did Sham lose the bet? 5. Can you find the next 3 letters in this sequence? 6. You have to think out of the box to solve this Fun Brain Teaser. FOUR is HALF of FIVE. 7. Sometimes the description of the given situation can be entirely different from what is being narrated. Here is such a twisting brain teaser puzzle to test your mind. Then she holds him under water for over 6 minutes. But 6 minutes later they both go out together and enjoy a wonderful dinner together. Now here is Simple Brain Teaser to test your knowledge. Again this is Memory Recall Brain Teaser. Here is something which you must have seen it in your lifetime and still sometimes it becomes difficult to recall it. 9. What is black when you buy it from the market, red when you use it, and grey when you throw it away? Next few are word brain teasers to test your word power. 11. What six letter word in the English language contains ten other words without rearranging any of its letters? 12. Name an English word of more than 2 letters that both begins and ends with the letters "he" in that order. There are two possible answers. "hehe" is not acceptable. This tough brain teaser even I could not answer. Anyway, something tough for one may be easy for someone else. Do check out if you are able to solve this one quickly? 14. There is a common English word that is seven letters long. Each time you remove a letter from it, it still remains a common English word - from seven letters right on down to a single letter. What is the original word, and what are the words that it becomes after removing a letter at a time? 15. This is an unusual paragraph. I'm curious how quickly you can find out what is so unusual about it? It looks so plain you would think nothing was wrong with it! In fact, nothing is wrong with it! It is unusual though. Study it, and think about it, but you still may not find anything odd. But if you work at it a bit, you might find out! Try to do so without any coaching! This brain twister will be very easy for US residents. 16. Hi! Ma and Pa told me I'd better say that all the two-letter words in this paragraph have something in common ...... or else! What's the common factor here? Out of box thinking will be required to solve this brain riddle. 17. What falls but never breaks? 18. Can you answer all seven of the following questions with the same word? a. The word has seven letters. 19. What is a word made up of 4 letters yet is also made up of 3. Although is written with 8 letters, and then with 4. Rarely consists of 6, and never is written with 5! 20. In olden days you are a clever thief charged with treason against the king and sentenced to death. But the king decides to be a little lenient and lets you choose your own way to die. What way should you choose? Remember, you're clever! 22. What is it that when you take away the whole, you still have some left over? 23. This one is a crazy brain teaser question which will make you think out of the box. Can you understand the following equations? Then she tells separately Month and Day of her birthday to Rajesh and Evanthe respectively. Rajesh: I don't know Ashu's date of birth. However, I know that Evanthe also does not know it. Evanthe: I was not knowing it however now I know Ashu's birthday. Rajesh: Then, I also know when Ashu's birthday is. Question is when is Ashu's birthday? Next one is brain bending brain teasers and one needs to think in many angles to solve this riddle. 25. Loretta's daughter Candace need to be picked from the school every day. Loretta asks one of her colleagues to pick her from school. Loretta devised a password mechanism to confirm that Candace goes with the correct person only. The password on Monday was LCM16. The password on Wednesday was RNW39. What will the password for Friday be? We wish if we can continue with this post, but good things always comes to an end. However I am not ending these brain teaser. 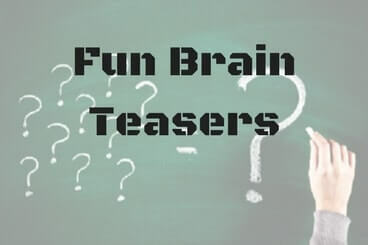 Instead of updating the new brain teasers on the same post, I have started new post titled "Out of Box Thinking Fun Brain Teasers with answers to Challenge your Mind" to continue with more Fun Brain Teasers. Very nice puzzles,there is also many puzzles in maths and they are also tricky.In my opinion you should involve maths puzzles in your blog. Thanks for your suggestion. I will definitely put some interesting math questions in this blog in future. link is not leading the answer page..is that correct? it's good set of questions. I checked the answer pages and found it fine. It will be great if you can let me know which pages did not load? After clicking on Click to Check Answer of this Simple Brain Teaser Question it linking to one new page there also in drop down same option is available but not getting answers for that. do the need full to get the answers page. Thanks in advance. >>>>>>>>>>>>>>>>>>>>>> and <<<<<<<<<<<<<<<<<<<<<< to watch the answer. If still any issue with reading answers, do lets us know? Thanks and it was nice to know that you enjoyed the puzzles here. I will add more puzzles soon here.